Use the following instructions to sync grades from the Pearson MyLabs to the D2L grade items. Roster icon-- will only show students who have clicked one of the MyLabs assignment links in the course. The Mylabs Roster and D2L rosters may not show the same students if all students have not click a Mylabs link. From the Manage Grade Sync window, Confirm the Grade Sync is On. To sync grades click the checkbox to the left of the associated assignment that you want grades to populate in the D2L grade items. --It can take the grades 2-3 minutes or a few hours to appear in the D2L gradebook. Wait at least 24 hours and try a couple of times to sync grades before submitting a ProfHelp ticket. --Any items not checked will be marked as disabled, and will no longer sync with your D2L gradebook. 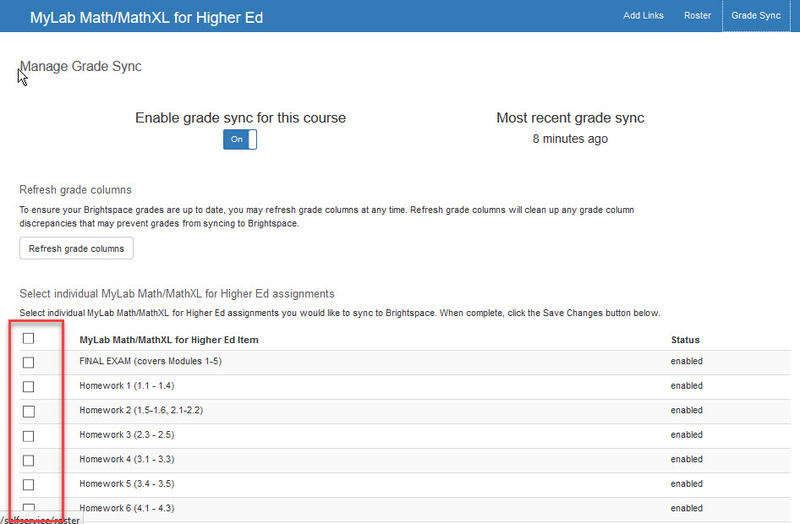 --Click the top checkbox to select all of the MyLabs graded assignments to sync to the D2L gradebook. This is only recommended at the end of the semester as syncing grades may cause students to see zeros in the D2L grade items on assignments that they have not yet complete. Review the How to Manage Incomplete Assignments in Pearson MyLabs to ensure student assignment grades are set to zeros if not complete. Posted by: Amy Sorensen - Mon, Jul 2, 2018 at 12:43 PM. This article has been viewed 681 times.